This plate was sold at the annual auction for the Metrolina AIDS project. 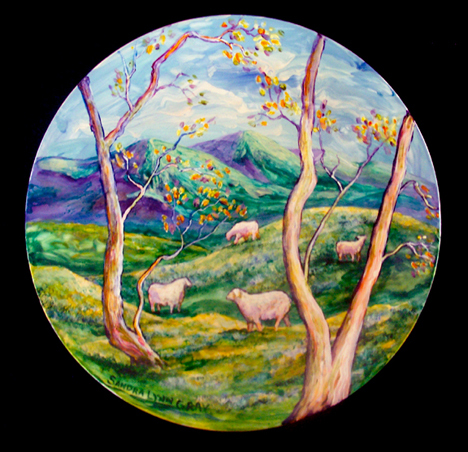 Local artists were invited to contribute an original plate to the auction. This plate is painted with oven bake ceramic paint (which I have found to be very permanent…..though I would not put it in the dishwasher) Putting the art on a plate followed the theme of “Guess Who’s Coming to Dinner”. MAP provided the plates to the artists and there were no rules as to what you could do. Some artists got really wild. I was conservative but it sold. Dinners were part of the fundraiser. Everyone from the Mayor to the lowliest student in jeans came to the event and had a good time. ~ by Sandra Lynn Gray on September 15, 2007.
oo oo oo! I love this!